The new year is a great time to replace your old toothbrush if you haven’t done it in a while. The American Dental Association recommends that you replace your toothbrush every 3 to 4 months. This of course, depends on how you take care of your toothbrush, how often you use it, and how vigorously you brush your teeth. Is it time for a new toothbrush for you? 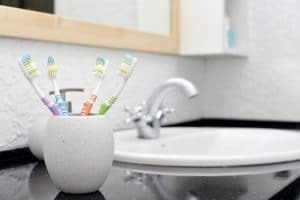 Did you know that your toothbrush is a breeding ground for a variety of microorganisms? Research shows that your toothbrush can be harboring over 10 million germs and bacterium. That’s one reason to replace your toothbrush every so often. It is also recommended that you replace your toothbrush after any illness you experience. That way if germs remain on your brush, you won’t reinfect yourself. After brushing your teeth every day, at least twice a day, your toothbrush can get worn. When your bristles become bent, fuzzy, and worn out, they are not as effective at cleaning your teeth. Research has proven that a new toothbrush removes more plaque than a worn toothbrush. Studies show that the average person uses the same toothbrush for nine months. According to the American Dental Association you should purchase a new toothbrush about every three months. If you are using an electric toothbrush, it is recommended that you replace the head at that point also. Nowadays, you can purchase a toothbrush with bristles that change color when it’s worn out. If you are using your toothbrush for more than 3 or 4 months at a time that may be a good idea!